If you can't get enough Glyos - and if you saw how Clawtron turned out, you can't - you may be interested in the next Galaxxor. Galaxxor 002/Nebularr hits 8:00 PM CST on January 25, 2017. It has a spare horned head and comes cast in colors you love, specifically white, blue, and orange. Click here for the blog post, and set aside $30 to get yours! Batch 61! A new secret figure, awesome upgraded Knights of the Slice crossovers, and more are still available. A mysterious mystery figure of mystery has sold out. Click here to see the January 17 2017 Onell Design drop menu. 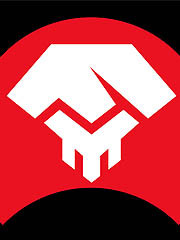 Onell Design posted a teaser for wave #61 - what's in it? No idea. But it's teased for a January 17 release, so carve out some time Tuesday night to see what's doing. Since its debut, the Outer Space Men Man from Uranus has really grown on me as one of the best. Sure Cosmic Radiation Orbitron looks like they just cast a Metaluna Mutant in glow plastic, but there are a few differences - not the least of which is that this one is a more convincing space alien thanks to it not wearing normal pants. Now cast on glow with silver highlights, you're either going to totally appreciate yet another Cold War-era monster in radioactive glow, or you're over it. I can see it being too much of a good thing, but if you're going to give me too much of anything I'm glad that it glows in the dark. 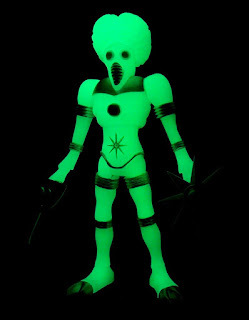 In case you neglected to set an alarm to order yours, the Cosmic Radiation Outer Space Men Orbitron is on sale now for $20.00. It's good! It glows! This is what makes life worth living. We've got a review on deck for Wednesday, so stay tuned for that. Believe it or not, I expected the look at White Star Commander Comet to be the obituary for this line - maybe I've said that before a few times. By the end of 2013 and 2014, fan sentiment toward the Four Horsemen's two Glyos properties seemed to straddle the fence between adoration and loathing. On one hand, Power Lords and The Outer Space Men were amazingly well-crafted indie toys using familiar licenses to make something for the discriminating action figure fan. On the other, to recoup the tooling investment fans were effectively used to subsidize the tooling with varied, dull unpainted figures like this one. Effectively a blank that didn't have the good sense to actually be unpainted, this figure was part of a set that actually cost more than the fully-painted figures while delivering less. Even more unfortunate, the set continued - 14 of the (so far) 17 unique characters were done up in bare white plastic. And, if you can believe it, the set is going to be finished up very very soon, and at least those three have more interesting designs that make more of the whole White Star motif. Cosmic Radiation The Outer Space Men Glow Orbitron goes up Friday! It's really cool, you'll like it. 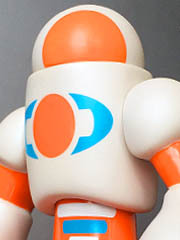 TheOuterSpaceMen.com will be selling this figure - along with any existing stock - and you're going to dig it. It has that glowing Glyos-compatible brain you've been wanting. The review will be coming soon - very soon!